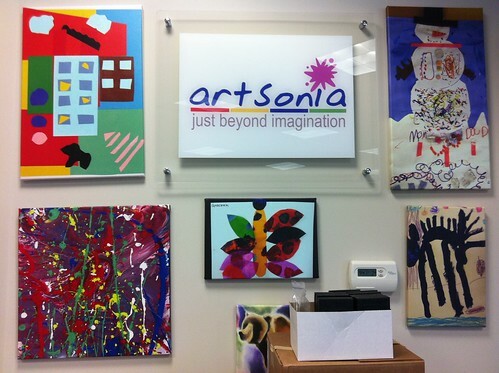 Recently, I had the incredible opportunity to visit Artsonia Headquarters out in Gurnee, Illinois! Click the photo above to see some behind the scenes pics. Art teachers, Tricia Fuglestad, Theresa McGee, Susan Bivona and I met with the Artsonia team to discuss ideas and offer suggestions. They have obviously been hard at work putting new features into place that will make this year even better for all of us who participate with Artsonia! *Earn 20% instead of 15%! Artsonia will donate 20% of every purchase of art keepsakes to your art program! *Request payment in the form of an iPad, Apple TV or Amazon Gift Card! Of course you can still request gift certificates or direct payment too. *Explore ideas regarding how to get new technology in your art room. Click the “Click Here” option on your fundraising page. From your teacher page, you can click “Technology in the Art Room”. They have added Tricia Fuglestad’s and my website http://ipadsinart.weebly.com/ as a resource and have also added Theresa Gillespie’s website http://ipadsintheartroom.weebly.com/ ! *Select “iPad Art- Generated on iPad Apps” to describe the media of your exhibit when you upload artwork! This will make it much easier to find iPad art when searching for ideas you may want to try with your students. *Leave positive feedback to your students that will appear immediately near the artwork in the public gallery. To do this, visit your teacher page. Click “Feedback for Students”. Select an exhibit and either enter feedback for one student at a time. Alternatively, you can write one comment to send to all students and then click the “copy to all” option. *Print your students’ “Artist Statements” from the exhibit of your choice! This will be fantastic when it is time to prepare for art displays and shows! On your teacher page, click “Artist Statements” in your “School Activity” box. Then, select the year and exhibit you want to print. Right click anywhere on your page and print. Instead of having to write or type up name tags, you can now simply select and print name tags featuring artist statements at the same time! This will save time and makes it possible for viewers to read what your artists have to say about their work! *Pin artwork to Pinterest using the new “Pin It” button on each of your students’ gallery pages. Of course you can still share artwork using the Facebook and Twitter buttons too. *Continue to follow Artsonia on Twitter http://twitter.com/Artsonia and Facebook https://www.facebook.com/Artsonia too! *View 10 galleries from the previous year on your school gallery page until you have uploaded new work. Instead of visiting a blank page, viewers will now start school right where you and your students left off at the end of the year. Thank you Artsonia for staying current and always looking to grow with us, our students and school communities!